2014 Weekend - Valley Potters Inc.
What a great time we had down in Gippsland last weekend! 5th & 6th of April 2014. Helena picked up Karen, Elizabeth and I on Friday afternoon and we were ready for a fun weekend of laughter, great company, woodfire pots and inspiration. After a slight detour we made it down to Venus Bay. Wine, cheese and dip on the table, oh this is the life! Saturday morning we were up early and headed to Sue Acheson’s at Rokeby. A beautiful property with the original house turned into her studio. We met up with Ruth, Meredith, Graeme, Jill and Tina there. Sue’s work is about people, the levels of society and how they change. She is also making more sculpture with wood and ceramics for exhibitions and public spaces. Sue uses hardwood timber like messmate and Victorian ash to fire her kiln which produces some earthy greens, as well as the oranges and browns. We, as is the Valley Potters tradition, stayed chatting and purchasing a bit longer than planned so we were running a bit late for our next stop. We finally made it to Dr Owen Rye’s studio, a bit late, where Ruth and Meredith were waiting for us. Owen’s studio is in an old school house, a fantastic space with lots of light. He showed us around his kilns, and how he has his chain and pullie system for loading wood into the stoke holes on his Anagama kiln. The timber Owen uses is mainly Cyprus which produces a good amount of ash to glaze his pots. He has all sorts of things that he has repurposed to help with firing. 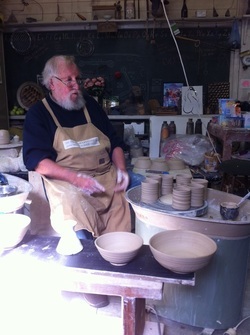 Owen demonstrated some throwing and then how he adds, alters and decorates his pots. We were all enthralled watching him and listening to his stories. I really didn’t want to leave such a beautiful place. I did a little shopping and got my Mother’s Day, birthday and Christmas present. The kids will have to keep wrapping the same pot. We went for a quick walk along the beach and then off to the pub for dinner. The next morning arrived at Zac Chalmers studio and gallery “Valley Plains Studio”. This was a modern building and it had the most fantastic view of the valley. Zac had just put on the kiln for a firing so I helped do some pointing on the kiln door, it’s a bit of a messy business but relaxing at the same time. We had morning tea there and Zac went through some throwing and decorating, all the while stoking the kiln. To get the soft silver and grey on his pots he uses tea tree and wattle. We did some more shopping, you know how tempting some beautiful pots are!! For lunch we stopped off at Koonwarra at a little café and then we went up to Robbie Barron’s studio “Gooseneck Pottery”. His Kiln is based on a Korean design with 4 chambers, it’s enormous!! We were talking to him about what slips he uses to decorate his pots and what timber he uses, again he uses the Cyprus and produces some exquisite chun’s. He is looking for volunteers to help with his next firing so if you’re interested give him a call. We said good bye to everyone there and made our way back home. I want to say a big thank you to Juliet, Gordon and Bailey for allowing us to stay at their holiday home, to everyone who made the weekend a great one, and to Olga for organizing it even though she was unable to come. I’m inspired and can’t wait to get started making pots for our woodfire workshop at Alistair Whyte’s in October.